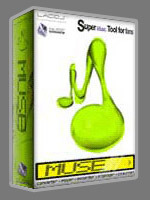 A super tool to convert and play music files, burn music CD and MP3 CD and DVD-RW, rip CD tracks. 15 formats, include MP3, WAV, AU, AIFF, WMA, VOB etc. Multiple languages. Support hundreds CD/DVD-RW writers.